Permanently tensioned screen for perfect picture quality. Improve your image�with a Clarion projection screen.How? The viewing surface is perfectly flat. And a perfectlyflat viewing surface means perfect picture quality. TheClarion�s viewing surface is stretched tightly over a selfconcealingaluminum frame, which also forms an attractive border, for a clean, theatre-like appearance. With a choice of M1300, M2500, glass beaded, or AT1200 acoustically transparent viewing surfaces, Clarion offers the surface that�s perfect for your projector. You won�t find a better image. You design the system: permanent wall mount or tilting; viewing surface; frame finish; format and size. Custom sizes available. Wallmounting brackets included. Choose a frame finish. Black aluminum is standard. 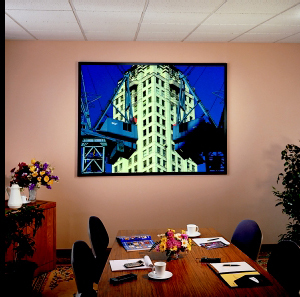 The standard black frame may be covered with velvety black Vel�Tex, which virtually eliminates all reflections on the frame. 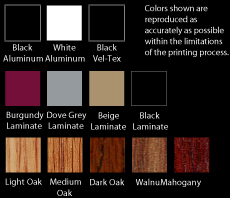 Laminates are available in 4 standard finishes (see below) as well as custom finishes. Hardwoods are available in 5 standard finishes (see below). Hardwoods and laminates are permanently attached to the structural aluminum frame.